The Eugene Ware Elementary School was constructed in 1934 and 1935 as part of the New Deal-era Public Works Administration. The Colonial Revival-style building was designed by architects Glen H. Thomas of Wichita and Ben W. Freidel of Fort Scott. Two thousand people gathered to witness the laying of the building's cornerstone on October 2, 1934, and the completed building was dedicated June 7, 1935. The building was still in use by the local public school district at the time of nomination. It was nominated as part of the "Historic Public Schools of Kansas" multiple property nomination for its significance in the areas of education and architecture. 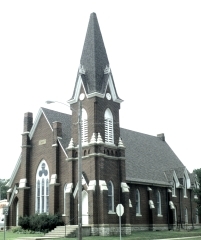 Fort Scott's First Congregational Church was built in 1873 in the Gothic Revival style, and it replaced an earlier wood church destroyed by fire. The brick church features pointed arch windows, a steeply pitched roof with a vaulted ceiling, and a 79-foot bell tower that includes a bell purchased by the original congregation. The Brethren Church purchased the building in 1920, but it had outgrown the building by 1973 and put it up for sale. Concerned about possible demolition, Grace Moore led a local campaign to save the building. The Historic Preservation Association of Bourbon County formed to assist with the preservation effort, and it purchased the building in 1978. This organization owned the building at the time of nomination. It was nominated for its local significance in the area of architecture. Designed by architect Ernst Brostrom and completed in 1925, the First Presbyterian Church is an excellent example of Collegiate Gothic-style architecture. The church sanctuary features stained glass windows made by Jacoby Art Glass Company of St. Louis, Missouri, impressive Gothic-inspired trusses, and seating for nearly 1,000 people. The church is located on a corner lot at the southwest edge of downtown and has hosted many community gatherings and events, including the funeral service of author and Fort Scott native Gordon Parks in 2006. The building is nominated for its architectural significance. Fort Scott was established in 1842 as a military post on the western frontier to prevent European American settlers from moving into the country west of the Missouri border that was reserved for American Indians. The U.S. Army abandoned Fort Scott in 1853 because the area was to be opened for settlement. 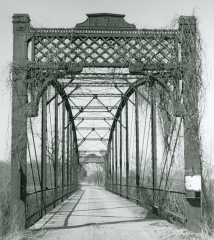 A community established around the abandoned post and eventually became the Bourbon County seat of government. Construction of permanent stone and brick buildings in the downtown began in the early 1860s and picked up after the close of the Civil War in 1865. The first railroad line - the Missouri River Fort Scott, and Gulf - pushed through the area in December 1869 bringing more people and goods to Fort Scott. 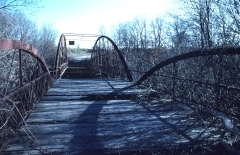 The town's fastest period of growth occurred from 1865 to 1888, and by June 1887, Fort Scott had become the fourth largest town in Kansas, with a population of approximately 14,000 people. 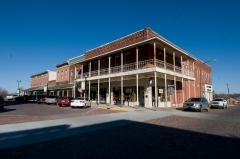 The downtown historic district includes nine-and-a-half blocks of the central commercial district that developed from 1863 until 1970 when urban renewal efforts demolished a number of commercial buildings to the north and east. The historic district boundaries are based on previous historic preservation survey and recommendations by the staff of the Kansas Historic Preservation Office. The district was nominated for its local commercial history, its association with the planning and development of Fort Scott, and for its representation of popular architectural styles. The Fort Scott National Cemetery is approximately a mile-and-a-half southeast of the former military post and downtown. Fort Scott was established by the US Army in 1842 to protect Indians and settlers along what was then considered to be the permanent Indian frontier. Troops participated in the Mexican War and missions of western exploration. The post was abandoned by the military in 1853. With the outbreak of the Civil War, the fort was reactivated in 1862 and this cemetery was established, replacing the old post cemetery that had become the town graveyard. The site includes a lodge designed in the Second Empire style by Brigadier General Montgomery C. Meigs and constructed in 1876. The nominated area includes 10.5 acres with nine contributing and three non-contributing resources. 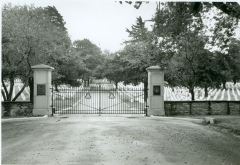 It was nominated as part of the "Civil War Era Cemeteries" multiple property nomination for its national significance in the areas of military history and architecture. Fort Scott was established by the US Army in 1842 to protect Indians and settlers along what was then considered to be the permanent Indian frontier. Troops participated in the Mexican War and missions of western exploration. The post was abandoned by the military in 1853. The buildings were sold at public auction in 1855 and became the town of Fort Scott. The Army returned to the post, garrisoning troops in the town, during the period of Bleeding Kansas (1854-1861), the Civil War (1861-1865), and regional land disputes of the early 1870s. 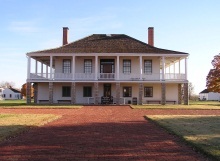 Currently administered by the National Park Service, the site includes 20 major historic structures, 33 historically furnished rooms, museum exhibits, and a bookstore. Interpretive programs, guided tours, and special events are offered throughout the year. 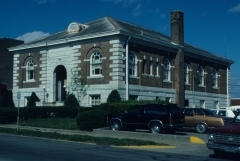 The community of Fort Scott received an $18,000 grant from the Carnegie Corporation Library Building Program in 1901, and construction of the library was completed in 1902. The building is an example of the Renaissance Revival style. It was one of 63 Carnegie-funded libraries built in Kansas during the first three decades of the 20th century. It was nominated as part of the "Carnegie Libraries of Kansas" multiple property nomination for its local significance in the areas of architecture and education. The Fulton High School and Grade School is comprised of three buildings. Designed by Wichita architect Fred G. McCune, the 1917 Progressive Era school building is a two-story brick example of a Town Graded School, which was built during a period of standardization in the education system. In 1936 a gymnasium/auditorium was attached to the north side of the brick school. This gymnasium, constructed as part of a Works Progress Administration (WPA) project, contains salvaged limestone from the demolition of an 1882 school building at the same location. The third building at the site is a free-standing, one-story cafeteria constructed in 1964. The property functioned as a combined high school and grade school until 1966 when the high school consolidated with Fort Scott; the elementary school closed in 1978. The property is nominated as part of the Historic Public Schools of Kansas and New Deal-era Resources of Kansas multiple property nominations.